Our Kickstarter for Fall of Man is still going, we are looking a a long horse here, maybe we went too big for out first project, but we are trying!!! 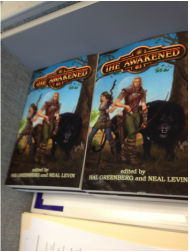 The Awakened finally is getting to all US backers with the foreign ones on the way soon for the paperback. Hardcover is experiencing some issues and is still being worked on, hope to here more on that soon. My collaboration with Stan! is still on, just being shifted due to some priorities. Samurai Sheepdog has a lot of projects we are working on and just brought in Warren Bailey to the company to help focus on certain projects, and so far we are thrilled to have him. The Awakened book II is being worked on as we speak, even though the publisher is still working on getting book I out to backers of his Kickstarter. Just got out flight booked for GenCon, hotel was already secured so now we wait!!! The shorts for The Awakened II are just as strong as book I and some of the characters will even come back to visit us again! More on The Awakened RPG soon ™.